Babies have been fed milk by artificial means for centuries. In the middle ages, for example, a cow’s horn with a piece of leather for a teat was widely used. By the 19th century 'pap boats' were in vogue; these were porcelain objects shaped like bowls, with small openings through which the milk was poured. They were difficult to clean, however, and when rubber was invented teated bottles quickly became the most common method of feeding babies. 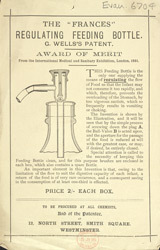 The bottle feeder featured on this leaflet was designed by G. Wells and could regulate the flow of the milk, ensuring that the baby could not drink too quickly.